Losing your sense of smell could be an early warning sign of Alzheimer’s disease, according to a new study. The study, published in JAMA Neurology, found that older people who had worse senses of smell were more likely to have mental difficulties which progressed to Alzheimer’s disease. The study’s findings suggest that sense of smell could be used to help screen for cognitive impairment, Alzheimer’s disease, and possibly other forms of dementia. The study looked at 1,400 seniors with an average age of 79 and normal mental functioning. The researchers conducted intermittent smell tests on the participants, in which they had to scratch and sniff different odors and choose the correct answer from four options. The smells included both food and non-food odors, including banana, turpentine, onion, gasoline, and paint thinner. After a follow-up period of 3.5 years, 250 people developed mild cognitive impairment. Mild cognitive impairment is an early stage of mental decline which can involve problems with memory and judgement. While it does not significantly affect day-to-day life, it can lead to dementia and declining mental health. Out of the participants with mild cognitive impairment, another 64 went on to develop dementia, including Alzheimer’s disease. The study found that people with worse scores on the smell test were 2.2 times more likely to develop mild cognitive impairment. As well, there was a correlation between bad test scores and the development of Alzheimer’s disease. The study also found that improvement in smell test scores was linked to an improvement in the severity of dementia. “The findings suggest that doing a smell test may help identify elderly, mentally normal people who are likely to progress to develop memory problems or, if they have these problems, to progress to Alzheimer’s dementia,” said Rosebud Roberts, lead researcher on the study and a professor of neurology at Mayo Clinic. Roberts believes that smell tests could be a standard screening tool for elderly patients. Poor scores on the test could be the first signs of mild cognitive impairment, which could lead to Alzheimer’s disease. As well, for patients who already have cognitive decline, the smell test could help predict whether they are likely to progress to Alzheimer’s disease or other types of dementia. Researchers believe that the study’s findings may be due to Alzheimer’s disease and other forms of dementia affecting the parts of the brain which distinguish smells. These parts of the brain may be the first to deteriorate with dementia. However, Roberts warns that people may score low on the smell test for other reasons, including chronic sinus and respiratory conditions. The study also did not prove a cause-and-effect relationship. Further research will have to be done on the link between declining sense of smell and developing dementia. Alzheimer’s disease is the most common form of dementia. About 10 to 25% of seniors are estimated to have mild cognitive impairment. 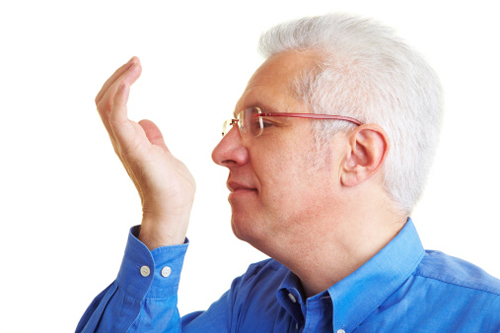 “Decreased sense of smell may indicate early dementia,” Medical News Today web site, November 16, 2015; http://www.medicalnewstoday.com/articles/302665.php. Reinberg, S., “Failing Sense of Smell Might Be Alzheimer’s Warning,” HealthDay web site, November 16, 2015; http://consumer.healthday.com/cognitive-health-information-26/alzheimer-s-news-20/failing-sense-of-smell-might-be-alzheimer-s-warning-705308.html.